This entry was posted on January 2, 2014 by Jessica Anderson. How do we as a company give back to our community? Once a quarter, we choose a charity to support through our 'Awards for a Cause' program. A portion of sales from specific trophies and awards goes to the chosen organization. Northwest Harvest is the only non-profit food bank distributor operating statewide in Washington. For the first quarter of 2014, our staff chose Northwest Harvest as Trophies2Go's 'Awards for a Cause' recipient. Northwest Harvest is the only non-profit food bank distributor operating statewide in Washington with a network of more than 360 food banks, meal programs and high-need schools. They provide more than 1.9 million meals every month and 30 million pounds each year to this network of emergency food providers. 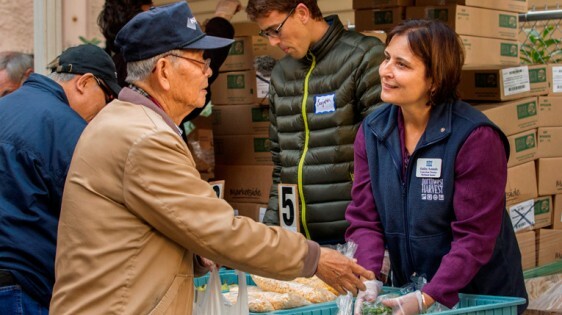 With distribution centers in western, eastern, coastal and central Washington, Northwest Harvest reaches rural communities where people in need have limited access to adequate and nutritious food. Northwest Harvest requires that food be given freely to anyone that asks, respecting their dignity while serving their need. They are committed to high nutritional standards and purchase a significant share of food to ensure a consistent supply of in-demand, nutritious products. 70 percent of the food they provide is highly nutritious fruits and vegetables. To find out more, visit the Northwest Harvest web page. Trophies2Go will make a donation to Northwest Harvest based on selected product purchases. For more information on this program, go to our Awards for a Cause page. Thank you customers for supporting our community by purchasing 'Awards for a Cause' products.